There were many musical factions when I was at school in the early 1970s, some more impassioned than others. There were us lot, a slightly tentative bunch, who favoured the more androgynous chart heroes: Bolan, Bowie and the like. The almost polar opposite of which (or so it seemed at the time), were those more self-confident, but infinitely less self-aware types who preferred the testosterone-fuelled stuff peddled by the likes of like Gary Glitter, Mud (they felt no awkwardness doing that Tiger Feet dance together) and most notably, Slade. I have a vivid memory of a group of five of so of these alpha males marching around the playground abreast, after every sixth step or so, stopping to punch the air and shout “Slade!”, before moving on to repeat the process. One could almost imagine them goose-stepping into Paris in 1940. We Bowie-ites generally skulked in the corners, away from such ostentatious displays of fealty – even if we knew in our heart of hearts, we were right and they were wrong. But, I have to say, despite them leaving me slightly cold at the time, over the years I learned to love all those Slade hits – particularly the mizpeltt ones. Even though I knew the main man – Lord Nodbert of Holder – had retired from performing, I still felt it may be rather fun to go along to hear these great tunes played live by the current incarnation of Slade. These days only guitarist Dave (Metal Nun) Hill and drummer Don Powell remain of the original line-up; the new lads being bassist/vocalist John Berry and guitarist Mal McNulty – with the newbies sharing the vocal duties. McNulty dealt with the louder, more shouty, Holder parts, with Berry taking care of the more balladic tunes: Everyday and Far Far Away and the like. And I have to say the pair, between them, made a passable imitation. Berry even took up a violin on a couple of tunes, as original bassist Dave Lea had back in the day. But the slightly scratchy noises which emanated there-from suggested to me it was perhaps not his first choice of instrument. Hill for his part, generally acted the same goat he has been doing for forty odd years, whilst Powell effortlessly kept the beat, chewing gum to the rhythm, whilst all the time sporting a faintly perplexed look on his face. As if unsure quite how he got here. 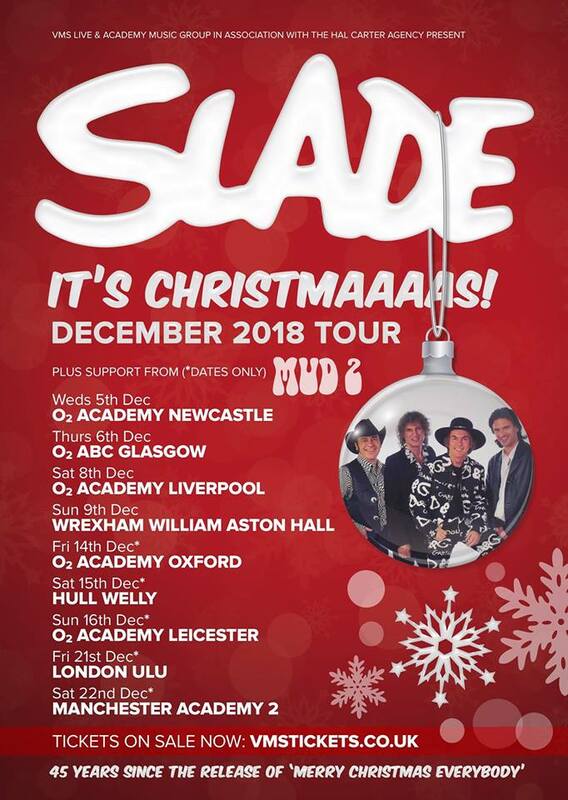 Proceedings opened with a slightly muddy-sounding rendition of my favourite Slade tune Gudbuy T'Jane, which the lads swiftly followed up with a couple more biggies: Tak Me Bak 'Ome and Look Wot You Dun. I can remember thinking at this point, that they had better start rationing out the hits, or we would soon be into near-misses and album tracks. But not a bit of it; for the familiar tunes (I knew them all, I was astonished to note), just kept coming and coming. was never going to float in these more enlightened times. Noddy no longer performs, but he was in the audience lending his support. In fact, there were a few of him. Due to the fire which destroyed the Glasgow O2 ABC in June of this year, this gig took place in the SWG3, a spartan former warehouse down by the Clyde. It was perfectly acceptable for a standing gig of this size, but goodness the place must possess one of the most efficient air-con systems in the city. For even with what looked like a capacity crowd of over a thousand partying wrinklies, the temperature in the place appeared to remain resolutely in single figures. I have never before been so glad to have brought a coat to a gig.